Looking for advice on natural health and wellbeing? Your local independent health store can offer a wealth of knowledge and expertise. 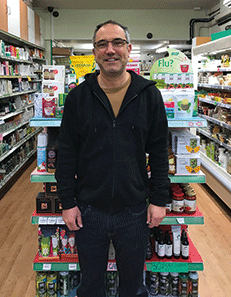 This month we speak to Matthew Lamb, owner of Down to Earth health store in Hove. We look forward to Fairtrade Fortnight each year. It’s the ideal time to remind our customers about the issue of Fairtrade and why it’s such a great way to shop. With the rise and rise of veganism and local sustainability, at times Fairtrade doesn’t get the attention it deserves. We love using the two-week period to bring it to the front of people’s minds again. In essence, each time you buy Fairtrade you are changing the world for the better in some small way. That’s quite an amazing thing to do, just by putting a Fairtrade product in your basket. We have a wide range of Fairtrade products at Down to Earth, from your well-known coffee and sugars to beauty products and more unusual offerings. Rather than having a dedicated Fairtrade area of the shop – we simply don’t have room – the products sit on the shelves with all our other products. When a customer comes in for their usual coffee, sugar or even their chocolate supply, staff here will point out the benefits that swapping to Fairtrade could have for the country of origin. We find that is the best way when it comes to Fairtrade – swap your morning coffee for a Fairtrade cup, add Fairtrade cocoa to your fairy cakes – that sort of thing. We put together a Fairtrade window display during the fortnight and love the chance to highlight our Fairtrade products. Plus, lots of the products come in gorgeous packaging and look great in a display. The Fairtrade movement is well established and has been going for a long time, but it is still great to remind our customers of the issues at hand. Making sure that the farmers and producers who made the products get a fair price that allows them to live dignified lives should be important to us all. Many consumers are looking to make sustainable choices nowadays and so another key point for us is to make sure people are aware that Fairtrade purchases help towards creating sustainable futures for us all. Understanding where our food has come from, and tracking the process from producer to buyer, is an enlightened way to shop and many young consumers are becoming more and more aware of that. When it comes to purchasing nowadays, customers have lots of different priorities and dietary requirements and so we understand that Fairtrade can slip into the background. The fortnight long celebration is the perfect time to bring it back to the forefront. Each year it means that as an owner I can evaluate our Fairtrade offering overall and whether we represent it as much as we can. It gives us the chance to educate ourselves further and pass that knowledge on to our customers. This year we will be holding a series of Fairtrade tastings in store. We find that when people are given the chance to taste the great products and then find out that often the cost is not higher than other products, they end up with something in their basket. One little swap can do a lot of good and that’s the aim for us. The more exposure Fairtrade can get, the better we say. Hove is a great spot for teaching the new generation about these important issues and it’s crucial that they vote with their wallets when it comes to picking the right products. This popular independent in Hove is a dedicated vegetarian health store. It was originally set up over 14 years ago and current owner, Matthew Lamb, has been running it since 2008. Head in store for tastings, expert advice and the friendliest customer service around. To contact the store, call 01273 770600 or email info@downtoearth-hove.co.uk.